N.T. Wright has written a plethora of books that span the spectrum between devotional and intense academic tomes. The Challenge of Jesus seeks to place itself somewhere in the middle of this spectrum. In the preface to this book Wright last out three goals that he has in writing this book. The first goal is to maintain historical integrity when talking about Jesus. The second goal is to help Christian disciples to follow the Jesus of Scriptures. The third goal is to help the next generation of Christ followers to love on mission in this postmodern world we find ourselves in. The majority of this book focuses on the first goal, and ends with two chapters that address the last two goals. This makes a lot of sense because if we are going to be able to live as disciples of Christ we need to now who Christ really was. 1-Where does Jesus belong within the Jewish world of his day? 2-What, in particular, was his preaching of the Kingdom all about? i.e. what was he aiming to do? 3-Why did Jesus die? In particular what was his own intention in going to Jerusalem that last fateful time? 4-Why did the early church begin, and why did it take the shape it did? 5-How does all this relate to the Christian task and vocation today? He answers each one of those questions in a separate chapter. Regarding question 1 Wright argues that Jesus was leading a messianic movement, not completely unlike other messianic movements of his time (yet also with a radically different twist.) In other words Jesus was announcing the Kingdom of God. Regarding the 2nd question, Jesus was creating new symbols of the Kingdom, the cross and the temple. By doing this he was reconstituting the people of God around himself. All of this pointed to an end of exile which was being accomplished by God in Christ. Why did Jesus die (question 3)? He died because it he believed it was his vocation to for Israel what Israel could not do and he believed that he would undergo the sufferings that Israel deserved for its unfaithfulness in other words, Jesus himself would go into exile and suffer at the hands of the enemy. This answer is related to the 4th question. The early church began because Christ was bodily resurrected, this meant that God was vindicating all that Christ has done. The exile is over and a new creation has begun. Finally the 5th question, how does all this relate to the Christian task and vocation today? Quite simply, Christians are to live as a part of new creation, as a part of this story that has climaxed in Jesus, and they are to live out the truth that Jesus really is the King and Messiah not only of Israel but of the whole world. Like most books written by N.T. Wright this book excels in its historical portrayal of the facts. Wright certainly has done his research (this book is essentially a condensed version of Jesus and the Victory of God) and his research almost always leads him to surprising, yet orthodox, conclusions. 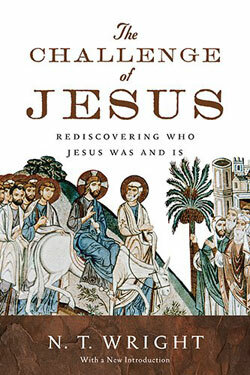 There is no doubt in my mind that Wright gets the historical picture of Jesus right in this book. However what Wright gets wrong, in this book and may other books where he addresses the church in out postmodern setting is in the application of those historical realities. That isn’t to say he doesn’t get the overall contours right – he says “our task is to implement his unique achievement.” (182). That is absolutely right, however the ways he calls the church to implement Christ’s achievement is a little bit off. This has been said of Wright before so I won’t belabor it. Even though he warns against those who emphasize the discontinuity between the present world and the next and throw up their hands in resignation and those who emphasize the continuity between the present world and the next and imagine we can build the kingdom of God by our own hard work he definitely tends to fall a little too much on the continuity side of things. At times he sounds like he has an overemphasized eschatology. Of course he denies this, but its clearly in his writings. However if it comes down to it, I would rather someone work hard for the Kingdom of God than throw up their hands and wait for heaven to come one day. Despite this one small downside in this book I highly recommend it. In my opinion this short book is the best introduction to Wright’s thought on who Jesus is.